Ok, One last post tonight, I have been coloring in all kinds of Bellas and I figured it was time to make them a home! I also had this totally cute patterned paper and just had to use all of it. The first card, I thought the sentiment totally fit the image, My pad ... or yours... Now most people would think that was a pick up line, but in the stamping world, well, you get the picture! I think this card is totally adorable, Once again, I had to use the patterned paper and I also added some designer tape in the center. This one is just something that I threw together. I used my SU! markers to color this one in instead of my watercolor pencils that I usually use. I couldnt decide on a sentiment to use on this one so I am going to have to come up with one before I send it out. I will be sing all 3 of these cards as RAK's, so you never know, It may end up in your mailbox! Nighty nights my friends!!! I have a winner on my Blog candy! I want to Thank everyone for playin and for all of the really nice comments! I so love sharing what I love to do and you all make it worth while! Kepp coming back often as I will be have some more candy to give away, I just love giving things away! Okay, I have the bestest Bella sistah evah, Her name is Lori and we have been Bella sistahs for the passed 3 months. She is the sweetest,nicest sistah that a person could want. On my Bellaholicsanonymous yahoo group we are paired with a sistah for 3 months and in that 3 months you get to know each other and send goodies,cards,ideas, etc. It is sunch a fun way to get to know someone and even learn bunches of new ideas! If you are not a member of the group yet and you lovey love love Bellas, You have got to go and sign up! It is a bunch of awesome ladies that are always there to help! So this is my last month as being Lori's sistah and I just recieved my package today, and oh my goodness, she spoiled the heck outta me. Here is a card that I made for a baby shower. 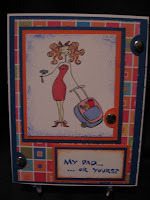 She is having a little girl so I made this card kinda could be boy, could be girl. I am not a real frilly type of person so this is the best that I could come up with! 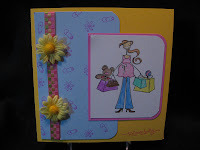 I used a stamped image that I recieved in a Bella image swap, colored her in and voila, A baby shower card! If you havent checked out Stamping Bella, you have got to stop what you are doing and head on over. They are the coolest most hippest most adorable stamps! I just lovey love love em! Another site for some CANDY! ok, I have been blog hoppin and wow, There are some amazing blogs out there, Michelleo's blog. Not only has she reached 5000 hits, she is giving away some really cool candy! Go ahead and check it out! Here is my entry into Beates weekend sketch challenge, This one was really fun to make! I have tons and tons of patterned paper and I really try to use it before I buy more(but I keep buying more) anyways, I finally used a little of one sheet. This patterned paper is from Stampin Up! and I have had it for quiet a while and I believe that it is retired. 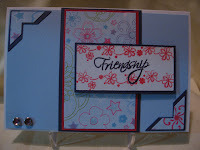 I also used one of my embossing folders(spots & dots). I stamped the image in a couple of different colors in versa magic and then embossed with clear EP. I just love that butterfly! You cannot tell too well but the butterfly is raised up with pop dots. I used close to cocoa,pixie pink,whisper white CS and the blue I am not sure what brand that is. These colors were fun to work with! I hope you enjoy my creation, come back often! Stampin Hugs!!! Check out this Blog! Awesome Blog candy! Here is a cool Blog to check out! She is giving away some really cool Blog candy! tons of goodies! WOW! I hit 1000 hits on my blog and since everyone has been so nice as to take a look at my blog, I am going to offer some blog candy! 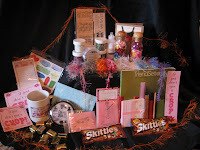 This blogging world is so much fun and what is more fun than getting a chance to win some sweets? This is what you are going to get, some AB rub-ons, some Jumbo blossoms by making memories, some deco ribbon made by Li'l davis designs, scrap- E words ( Friends & Family theme)and last but not least a darling card stamped by me with Imeldabella by stamping bella with 10 stamped images tucked inside(of image shown) How sweet is that? 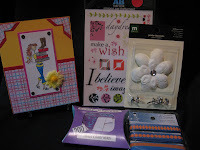 Well all you have to do is leave me a comment on my blog and a winner will be chosen on Saturday May 31st. at 9pm. So get those comments in and enter for your chance for some cool goodies! 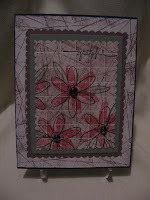 Here is a card I made using the "Grid Technique" You can find the tutorial for it on Splitcoast Stampers" There are so many awesome tutorials on SCS. Go and check it out! With this card I used Night of Navy,vanilla,Sage shadow and close to cocoa CS and I used the close to cocoa classic stampin pad to make the lines on the CS. I just placed it firectly on the CS. The stamp set I used is from SU! from a way long time ago. It is called Flower Fest. The word "grateful" is from Small Script. I hope you enjoy my creation! Happy Stampin All! Shout out to sheetload, Check it out! 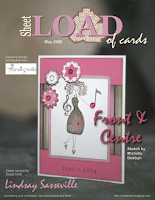 Oh my goodness, What a cool Blog, You have got to get on over to "Sheetload of Cards" There are sketches,examples, tutorials! I just love to go check out what they have goin on over there! Not to mention they have some Blog candy that is very cool! Cmon, go on over and check em out! Hello all, Well I had every intention of adding my Card to Beates WSC but my computer was being a pain in the rear and just wouldnt let me do ANYTHING! Then I get a phone call from Comcast saying that our neighborhood was having Tech. difficulties. Wow, I wish I new that last night then I wouldnt have sat here and cursed my computer till 11 pm. Well anyways, I still want to post what I had made for her challenge because I really like how this card came out. I used total scraps on this card( no lack of scraps in this house) I used the sentiment from Frendship Blessings(CTMH) and my awesome corner punch, I just love that punch. The cardstock I used was Whisper white, Bashful blue and real red. Ant the 2 gemstone eyelets are from SU! I have a winner on my first PIF and it is Stephanie over at http://stampincats.blogspot.com/, Check out her Blog, she has some pretty cool stuff! http://www.lil-bittacreativity.blogspot.com/ She too has some pretty neat stuff goin on in her Blog!